This element was a simple one to build. 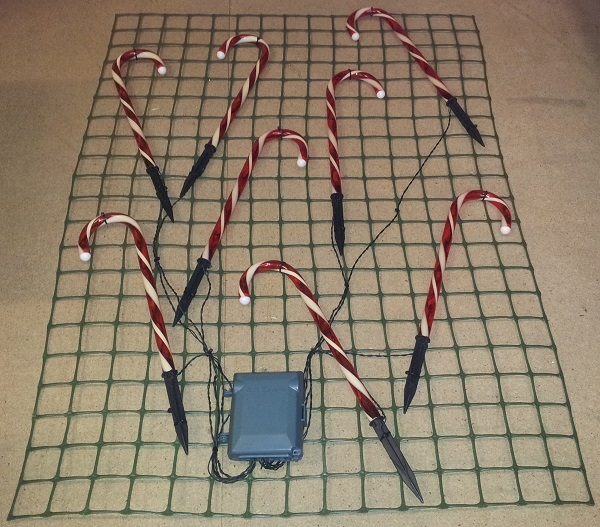 The 32cm candy canes were zip tied to a piece of garden mesh. In turn, the plastic mesh was zip tied (in the corners) to the window grill. This made the element very quick to put up and take down each season. 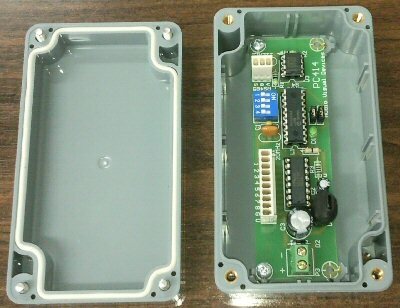 A small P-DMX controller housed in a small box was also attached to the plastic mesh. Since the canes were from solar sets, I had to add a series resistor to each cane for it to work on 12V. A CAT5 cable runs back to the P-DMX distributor in the controller cabinet. When I first built this candy cane mesh element in 2011, I used a simpler controller that only supported on/off outputs (no dimming). It was not originally a P-DMX board, but a few mods soon took care of that. This board served me well until I replaced it with the one pictured above with the mesh.